Add sweetened condensed milk and vanilla and beat until smooth and creamy. Add powdered sugar and beat until the mixture thickens slightly. Fold in whipped cream, or add liquid heavy whipping cream and continue to beat until the mixture gets a little bit fluffy. Refrigerate mixture until ready to serve. 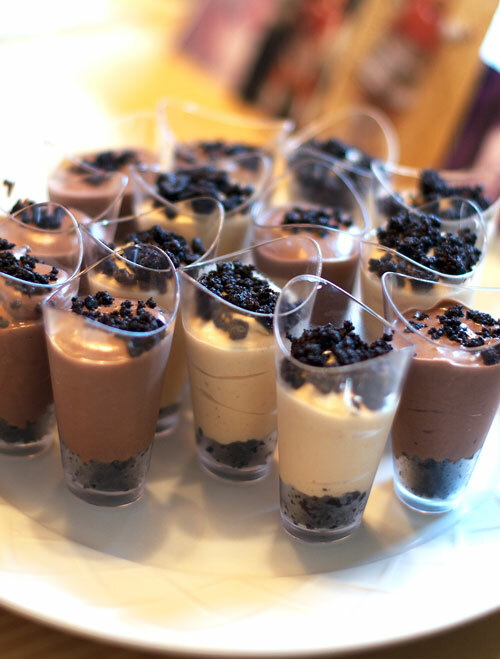 Stir melted butter in with crushed Oreos and press 1 teaspoon crumbs into the bottoms of dessert shooter cups. Pour peanut butter mixture into a plastic baggie, snip the corner, and pipe into the cups (on top of the crumbs). Sprinkle the tops with another ½ teaspoon of crumbs. Top with a sprinkle of sea salt for an extra sweet-salty combo. Refrigerate until ready to serve. Peanut Butter Pie will thicken as it sits in the refrigerator. I actually prefer to eat these after they’ve been in the fridge overnight.